Results of a recent survey about stroke resources conducted by the Canadian Stroke Network16 revealed several factors that could account for some of the observed variation in stroke care: the lack of implementation of practice guidelines, infrequent availability of inpatient and ambulatory stroke rehabilitation programs, scarcity of stroke prevention clinics that provide risk-factor management and management of high-risk patients with recent transient ischemic attack or minor stroke, and limited access to computed tomography scanners and therapies such as acute thrombolysis within the therapeutic window for effectiveness. Similarly, results of a survey by Dumoulin and colleagues,17 which used standardized stroke scenarios to evaluate services provided by 1800 stroke rehabilitation clinicians, revealed important variations in practice choices. The findings of these audits and surveys demonstrate the need to improve the prevention, treatment and rehabilitation of stroke in Canada. The Canadian Stroke Strategy, a joint initiative of the Canadian Stroke Network and the Heart and Stroke Foundation of Canada, prioritized the development, dissemination and implementation of evidence-based best-practice recommendations for stroke care as a mechanism for reducing variations in practice and improving stroke care. Canada needed a single, standardized set of recommendations that would address the full continuum of stroke care, be relevant to the Canadian health care system, synthesize the strongest supporting evidence for best practice in stroke care and provide a clear, prioritized agenda for system improvements throughout the country. Organizations in other countries have published stroke guidelines (see www.strokecenter.org/prof/guidelines.htm). Although, collectively, existing guidelines cover the continuum of stroke care, many guidelines focus on a single component. Not all existing recommendations are relevant to the Canadian health care system; for example, some are models for health care and service delivery specific to a particular country and its available resources. In addition, the target ranges for blood lipid and glucose levels and blood pressure readings are not consistent across existing guidelines. All guidelines were reviewed using the standardized AGREE (Appraisal of Guidelines Research and Evaluation) instrument.18 Findings from this review revealed that the quality of the processes with which existing guidelines were developed and linked to evidence varied among guidelines. For example, most guidelines indicated the strength of the evidence that supported their recommendations. Fewer provided strategies for uptake or addressed health system requirements for, and barriers to, implementation. To our knowledge, no guidelines have attempted to narrow the set of evidence-based recommendations to prioritize the order of implementation. Also, no guidelines have directly addressed performance measurement or processes for evaluating the impact of implementation within their recommendations. Therefore, no one currently published guideline was considered to be comprehensive or user-friendly enough to meet the goals of the Canadian Stroke Strategy. An interdisciplinary working group of the Canadian Stroke Strategy produced the best-practice recommendations through a structured evidence-review and consultation process, in accordance with a validated framework for evaluation and adaptation of practice guidelines.20 The composition of the working group is shown in Appendix 1, available at www.cmaj.ca/cgi/content/full/178/11/1418/DC2. The group was divided into 4 task groups to work on specific recommendations. This initiative was informed by 2 previous Canadian studies: the Canadian Stroke Quality of Care Study21 and the Stroke Canada Optimization of Rehabilitation through Evidence (SCORE) project.22 These studies addressed different components of best practices in stroke care, but they were not comprehensive enough to meet the objectives of the Canadian Stroke Strategy. The working group made an effort to align the stroke recommendations with those of the Canadian Diabetes Association, the Canadian Hypertension Education Program and the Canadian guidelines for the management and treatment of dyslipidemia to ensure that clinicians would receive a single, consistent message regarding the management of patients with these conditions and stroke. More than 40 relevant guidelines were identified through an extensive literature review. The search strategy identified articles and guidelines published from 1990 to 2006 in the following databases: MEDLINE, CINAHL, HealthStar and Evidence-Based Medicine Reviews, which includes Cochrane databases, ACP Journal Club, Database of Abstracts of Reviews of Effects and the Cochrane Controlled Trials Register. Key search terms included “cerebrovascular accident,” “stroke,” “cerebrovascular disorders,” “transient ischemic attack,” “subarachnoid hemorrhage,” “intracerebral hemorrhage” and “rehabilitation,” each used in combination with terms such as “clinical practice guidelines,” “care pathways,” “systematic reviews,” “randomized controlled trials,” “observational study,” “consensus statement,” “position statement” and “policy statement.” Manual searches of the tables of contents and reference lists of major peer-reviewed stroke journals, and other relevant articles and journals published from 2003 to 2006, were also completed. In addition, an Internet search on Google with the search term “stroke guidelines and recommendations” identified sites such as National Guidelines Clearinghouse, Ontario Guidelines Advisory Committee, World Health Organization and the Internet Stroke Centre. Websites of stroke organizations in other countries and regions (e.g., the United Kingdom, Australia, New Zealand, Europe and the United States) were also searched. Only guidelines with high overall quality ratings, particularly in the “rigour of design” section of the AGREE tool, were considered for adaptation in the development of the Canadian guidelines. Existing guidelines were included in the final set if they were published in English or French within the past 10 years, were developed by a group process, were evidence-based, contained clearly defined and specific clinical recommendations and targeted stroke clinicians. Fourteen sets of guidelines were included in the final review by the 4 interdisciplinary task groups. Group members reviewed each guideline to select, adapt or develop proposed recommendations in their assigned topic area: acute care, rehabilitation, prevention and community care (Table 1). All members reached agreement with the final proposed wording of the recommendations, which were further refined and confirmed at a national interdisciplinary consensus conference with 40 panellists (20 task-group members and 20 external participants). At the panel meeting, each recommendation was discussed and input received on final wording. Only 1 recommendation, on hypertension, required more extensive additions and expansion. This work was completed following the consensus panel and finalized among 5 panel members via teleconference. External consultations were held for final input, critique and validation and included 8 key informants and several professional groups. No significant changes were required as a result of these consultations. Stroke survivors and family members participated at all stages of the guideline development process. The final recommendations met a set of predefined criteria for inclusion. Recommendations were included if they were supported by the highest levels of evidence (e.g., level A or level 1, depending on the rating system, which indicates that these are based on evidence from randomized controlled trials or meta-analyses); were considered by the national interdisciplinary consensus panel to be critical for systems change; appeared in more than 1 published guideline statement or reflected strong emerging evidence; collectively represented the full continuum of stroke care; and were relevant to the Canadian health care system. Experts in performance measurement and analysis within the Canadian Stroke Strategy then developed a core set of performance measures to evaluate the implementation of each recommendation and its impact on patient outcomes. Similar to the recommendations, the performance measures met predefined criteria of having evidence for relevance, validity, opportunity for improvement and feasibility of measurement at a reasonable cost (Appendix 2, available at www.cmaj.ca.cgi/content/full/178/11/1418/DC2).21 Detailed measurement equations, including numerators and denominators; cautions about data quality; and information on appropriate data sources were provided in a supplementary manual on performance measurement. This unique feature of providing the performance measures directly in the recommendations document made the Canadian guidelines more comprehensive than previously published guidelines. This was considered to be essential because the public and funders increasingly demand accountability within the health care system, and the performance measures support the imperative to be accountable for the quality of health care delivery and improvements. 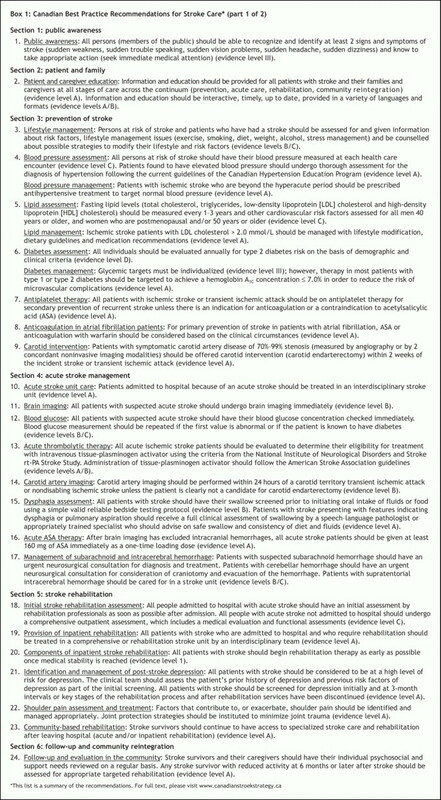 The final best-practice guidelines consist of 24 recommendations that are presented in 6 sections: public awareness and responsiveness; patient and family education; prevention of stroke, which focuses on lifestyle management and secondary prevention; acute stroke management; stroke rehabilitation; and follow-up and community reintegration after stroke (Box 1). Box 2 displays the unique format of these recommendations using the example of care in an acute stroke unit. Recommendations such as patient and family education, and identification and treatment of depression after stroke are relevant to, and should be implemented throughout, the continuum of care by all health care professionals. Those on stroke rehabilitation emphasize the need for early assessment of rehabilitation potential with the use of standardized assessment tools. They then address the critical components of providing inpatient or community-based rehabilitation. The rehabilitation section does not provide detailed recommendations for each functional area affected by stroke because these recommendations are contained in related work by the SCORE project.22 To avoid duplication, the Canadian stroke recommendations include links to the SCORE project and endorsement of that work. The Canadian Best Practice Recommendations for Stroke Care advocate a coordinated and integrated approach to stroke prevention, treatment, rehabilitation and recovery in the community. The dissemination of these recommendations is a critical component of a multifaceted approach to reaching this goal. Dissemination activities include provincial and local consultations with front-line clinicians and political decision-makers to discuss the recommendations as well as the challenges and successes realized during implementation. Teaching materials, learning modules and point-of-care tools are also being developed to support implementation of the recommendations in different clinical settings. The Canadian recommendations uniquely include sections outlining the implications for the health care system as well as specific performance measures for each recommendation (Box 2). The system implications describe the key resources and processes that are required for effective implementation of the recommendations. These key enablers require dialogue and action by health system policy leaders and managers in collaboration with clinicians. The set of performance measures is provided to enable clinicians, policy-makers and managers to measure and monitor the impact of implementing the recommendations using a consistent and standardized approach, and to determine baseline performance levels and changes in performance related to the delivery of stroke care over time. Audit tools that contain all required elements to calculate each performance measure are currently being finalized. The results of early data collection are already being used to demonstrate to funders the value of coordinated stroke care. These results are also being used locally and within regions to guide quality-improvement activities, such as improved access to computed tomography immediately upon arrival in the emergency department, development of specialized stroke units and demonstration of the need for rehabilitation assessments. This standardization of measurement facilitates ongoing activities to establish benchmarks and targets for stroke care performance within Canada. The reorganization and standardization of services poses considerable challenges, particularly in rural areas. For example, results of a survey conducted across Canada in 2006 by the Canadian Stroke Network16 (n = 173; 35% response rate) indicated that most stroke care in Canada was provided by internal medicine specialists and primary care physicians, both in hospital and in the community. A minority (41%) of small and rural hospitals had implemented clinical practice guidelines for stroke care, compared with 63% of larger community-based hospitals and 81% of teaching hospitals.16,23 A similar survey (unpublished data) of acute care hospitals (n = 102; 93% response rate) in the predominantly rural provinces of New Brunswick, Newfoundland and Labrador, Nova Scotia and Prince Edward Island in 2004–2005, using an instrument adapted from one used to conduct a similar survey in Ontario in 1999.24 They found that 81% of emergency departments did not provide thrombolytic therapy and that 77% of hospitals did not have a formal protocol for managing stroke patients. Once admitted, 89% of stroke patients received care in general medical wards and only 19% of hospitals provided coordinated interdisciplinary care. Data from an extensive evaluation of the Ontario stroke system highlights the need for system-wide implementation strategies.6 These strategies may include restricting the number of hospitals providing stroke care to achieve “critical mass” in those that do, professional education programs to increase human resources, the use of telemedicine technology and the development of point-of-care reminders and tools to support clinical practice. Ongoing audits of performance and provision of feedback directly to service providers may also promote implementation and inform the ongoing effort to minimize regional disparities in the delivery of stroke care in Canada. Since the release of the Canadian stroke care recommendations in 2006, many individual provincial stroke strategies have adopted these recommendations, identified priority areas for implementation and developed educational resources to support implementation. Many local health care facilities already had some of the recommendations in place, including the establishment of stroke units, rapid access to computed tomography and standing orders for antiplatelet therapy. These facilities have used the stroke recommendations as an opportunity to expand the scope of stroke practices. Other facilities have used the recommendations as a starting point to develop protocols for acute thrombolysis in their emergency departments and increase access to rehabilitation therapists during acute care and after discharge. Evaluations of the impact of implementation strategies are under development because only a few provinces had processes to conduct systematic monitoring of performance in place before this year. To ensure the validity and applicability of the Canadian recommendations for stroke, they will be updated on a 2-year cycle. Additional recommendation topics have been identified based on newer research and feedback from the first iteration and will be included in the next update, which is expected in the fall of 2008. These topics include management of minor stroke and acute transient ischemic attack, cognitive impairment in stroke, prehospital systems for stroke and components of acute inpatient care. Opportunities are also emerging to collaborate with developers of stroke guidelines in organizations globally to consolidate guideline efforts and increase standardization of stroke management across geographic boundaries. Improved access to consistent and standardized stroke care, regardless of where in Canada a stroke occurs, is urgently needed. The Canadian recommendations have substantial implications for clinicians, managers and policy-makers alike. As the burden of stroke on the health care system and the broader social community continues to increase with changing population demographics, a shift in the way stroke care is delivered toward better integrated and coordinated systems of care becomes imperative. Bringing about change will require effort at multiple levels in the health care system. Economic modelling, and experience in the United States and Ontario, indicate that adherence to best-practice recommendations will reduce stroke mortality and morbidity and save money.24 However, the challenge will be to identify and overcome barriers to applying the recommendations. Bringing about change will require political will and collaboration throughout the health care system. Contributors: Patrice Lindsay is the principal author and is the project leader for the Canadian Stroke Strategy Best Practices and Standards working group as well as the Information and Evaluation working group. She was the primary project leader and editor of the best practices document and conducted much of the background research and reviews. Mark Bayley contributed significantly to the development of the guidelines and this manuscript as the Principal Investigator of the Stroke Canada Optimization of Rehabilitation through Evidence (SCORE) project. Alison McDonald is the co-chair of the Canadian Stroke Strategy Best Practices and Standards working group and is responsible for guiding the development process. She actively contributed to the editing of the recommendations and this manuscript. Grace Warner is a member of the Information and Evaluation working group and contributed information to this manuscript related to the Atlantic Canada Stroke Resource Survey and the development of the performance measures that accompany the recommendations. Stephen Phillips is the senior author and contributed substantially to the writing and formatting of this manuscript. He is also the co-chair of the Canadian Stroke Strategy Best Practices and Standards working group. He played a major leadership role throughout the guideline development process. Moore R, Nao Y, Zhang J, et al. Economic burden of illness in Canada, 1993. Ottawa: Environmental Risk Assessment and Case Surveillance Division, Laboratory for Disease Control; 1997. Heart and Stroke Foundation of Canada. The growing burden of heart disease and stroke in Canada 2003. Ottawa: The Foundation; 2003. Available: www.cvdinfobase.ca/cvdbook/CVD_En03.pdf (accessed 2008 Mar 10). Katzmarzyk PT. The Canadian obesity epidemic, 1985–1998. CMAJ 2002;166:1039-40. Schwamm LH, Pancioli A, Acker JE, et al. Recommendations for the establishment of stroke systems of care: recommendations from the American Stroke Association's Task Force on the Development of Stroke Systems. Stroke 2005;36:690-703. Sharma M. Billions of dollars, tens of thousands of lives at stake — Why aren't proven stroke solutions being used consistently in Canada? [media release] Canadian Stroke Network; 2006 June 14. Available: www.canadianstrokestrategy.ca/eng/whatsnew/news%20releases/june14_2006_en.pdf (accessed 2008 Apr 18). Lindsay MP, Ladak N; Ontario Stroke Evaluation Advisory Committee. Integrated stroke care in Ontario: stroke evaluation report 2006. Ottawa: Canadian Stroke Network; 2007. Available: www.canadianstrokestrategy.ca/eng/resourcestools/documents/Ontario%20Stroke%20Evaluation%20Report%202006.pdf (accessed 2008 Apr 18). Kapral MK, Silver FL, Richards J, et al. Registry of the Canadian Stroke Network progress report 2001–2005. Toronto: Institute for Clinical Evaluative Sciences; 2005. Available: www.ices.on.ca/file/RCSN_TechnicalReport_final.pdf (accessed 2008 Mar 10). Kapral MK, Lindsay MP, Silver FL, et al. Registry of the Canadian Stroke Network. Report on the 2002/03 Ontario Stroke Audit. Toronto: Institute for Clinical Evaluative Sciences; 2006. Lewis M, Trypuc J, Lindsay P, et al. Has Ontario's stroke system really made a difference? Healthc Q 2006;9:50-9. Kapral MK, Laupacis A, Phillips SJ, et al; investigators of the Registry of the Canadian Stroke Network. Stroke care delivery in institutions participating in the Registry of the Canadian Stroke Network. Stroke 2004;35:1756-62. Field TS, Green TL, Roy K, et al. Trends in stroke occurrence in Calgary. Can J Neurol Sci 2004;31:387-93. Hudson J, Ross C, Taylor K. Joining forces to deliver improved stroke care. Victoria (UK): National Audit Office; 2007. Heuschmann PU, Biegler MK, Busse O, et al. Development and implementation of evidence-based indicators for measuring quality of acute stroke care: the Quality Indicator Board of the German Stroke Registers Study Group (ADSR). Stroke 2006;37:2573-8. Lewis et al. The AHA/ASA Get with the Guidelines — Stroke Program is associated with improved use of warfarin in patients with current atrial fibrillation and stroke [abstract]. Stroke 2007;38(Suppl):480. Canadian Stroke Network. Stroke services and resources inventory: a national survey initiative. Ottawa: the Network; June 2007. Available: www.canadianstrokestrategy.ca/eng/resourcestools/documents/CSN_SSRI%20Report%20June%202007.pdf (accessed 2008 Apr 18). Dumoulin C, Korner-Bitensky N, Tannenbaum C. Urinary incontinence after stroke: identification, assessment, and intervention by rehabilitation professionals in Canada. Stroke 2007;38:2745-51. AGREE Collaboration Writing Group; Cluzeau FA, Burgers JS, Brouwers M, et al. Development and validation of an international appraisal instrument for assessing the quality of clinical practice guidelines: the AGREE project. Qual Saf Health Care 2003;12:18-23. Canadian Stroke Strategy. 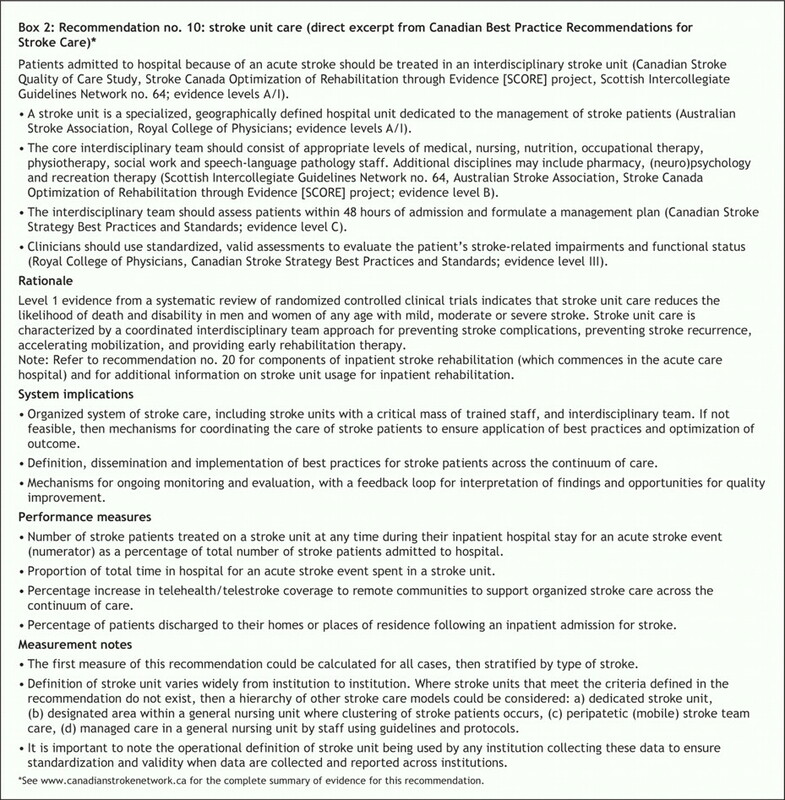 Canadian best practice recommendations for stroke care. Ottawa: Canadian Stroke Strategy; 2006. Available: www.canadianstrokestrategy.ca/eng/resourcestools/documents/StrokeStrategyManual.pdf (accessed 2008 Mar 10). Graham ID, Harrison MB, Lorimer K, et al. Adapting national and international leg ulcer practice guidelines for local use: the Ontario leg ulcer community care protocol. Adv Skin Wound Care 2005;18:307-18. Lindsay MP, Kapral MK, Gladstone D, et al. The Canadian Stroke Quality of Care Study: establishing indicators for optimal acute stroke care. CMAJ 2005;172:363-5. Hurdowar A, Graham ID, Bayley M, et al. Quality of stroke rehabilitation clinical practice guidelines. J Eval Clin Pract 2007;13:657-64. Schwamm LH, Pancioli A, Acker JE, et al. Recommendations for the establishment of stroke systems of care. AHA Scientific Statement. Stroke 2005;36:690-703. Tu JV, Porter J. Stroke care in Ontario: hospital survey results. Toronto: Institute for Clinical Evaluative Sciences; 1999.